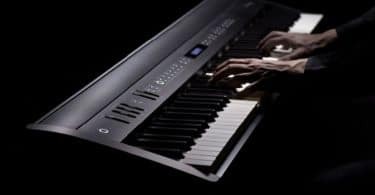 In this Yamaha Arius YDP-180 review we will go over this piano in great detail and discuss why I think it’s one of the best digital piano’s money can buy. If you’re visiting this particular article, it’s very likely that you’re considering purchasing the YDP-184. It’s a great purchase for a moderate to serious piano teacher, a practicing musician or professional pianist, at a much more affordable price as opposed to a traditional acoustic grand piano. In this piece, I’ll help you figure out if the Arius is worth splurging, given the the quality it offers you. The YDP-184 is gorgeous and modern, which is a pretty important concern for a piano that is usually something of a permanent fixture for most owners. Luckily, it is less of a fixture and more of an art piece - the YDP-184 is sleek and tasteful with a flair of elegance, and no shortage of class. It has a refined design, without being overpowering or gaudy. Additionally, Yamaha has long been one of the best brands in the music industry - so there’s not really any question that you’re getting a quality product. The Arius is beautiful to look at, but more importantly, it’s beautiful to listen to and play. The speakers are 60-watt and pack a huge punch for the physical size of the piano, but it also offers audio output option, if you are playing in a larger venue, such as a place of worship or a concert hall. That being said, the size to sound ratio on the Arius is fantastic. The YDP-184 isn’t much bigger than a upright wall piano, but it belts out notes like a full sized acoustic, which is a huge selling point for a digital piano in its weight class. 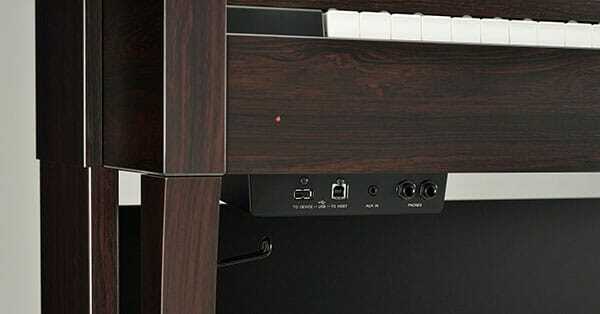 The unique sound of acoustic pianos is sought-after in digital pianos, and the YDP-184 delivers in a smaller footprint than a lot of its competitors. As for the included sounds, the Arius doesn’t disappoint - it comes packaged with 24 voices, one of which is a detailed waveform captured from Yamaha’s very own CFIIIS Concert Grand Piano, which has been played by the world’s top pianists at some of the most prestigious concerts played worldwide for the last few decades. For a little perspective, the sound of the Arius is a digitally enhanced rendition of one of the best pianos ever made. The YDP-184 has just about every voice a pianist could want, as long as you’re not looking for something specialized - such as a drum kit or sounds better served by a synthesizer or digital keyboard. The Arius excels where you’d expect it to excel - piano and organ voices. Mechanically, the Arius YDP-184 is a very well-designed and smoothly engineered piece of work. The keys are coated with Yamaha’s proprietary finish to avoid slipping or wear from prolonged play, and the pedals are modeled after Yamaha’s CFIIIS Concert Grand Piano ; with note sampling taken from the pedaled notes and embedded in the Arius with Virtual Resonance Modeling. This is an audio encoding method that goes far beyond simple sound playback, recreating the notes in stereo in real time as you play. 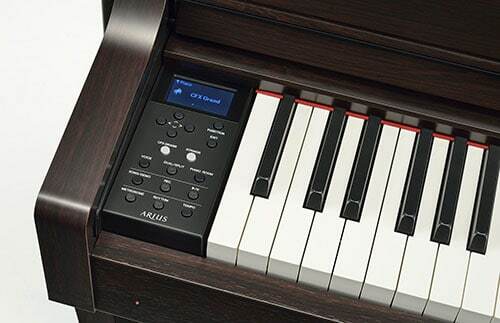 The Arius has an LCD screen tucked away to the left of the keys; big enough to use comfortably, but small enough to not distract from the classic feel of the piano’s design. The LCD panel provides an easy way to access voices, audio settings, and audio recording. The piano also has a small collection of ports hidden under the main body- easy to access, but hard to notice if you’re not looking! This supports MIDI connectivity for recording music, practicing, or exporting/importing sounds; USB connectivity for digital storage of music, a headphone jack to practice privately, and audio output jacks for speaker systems. 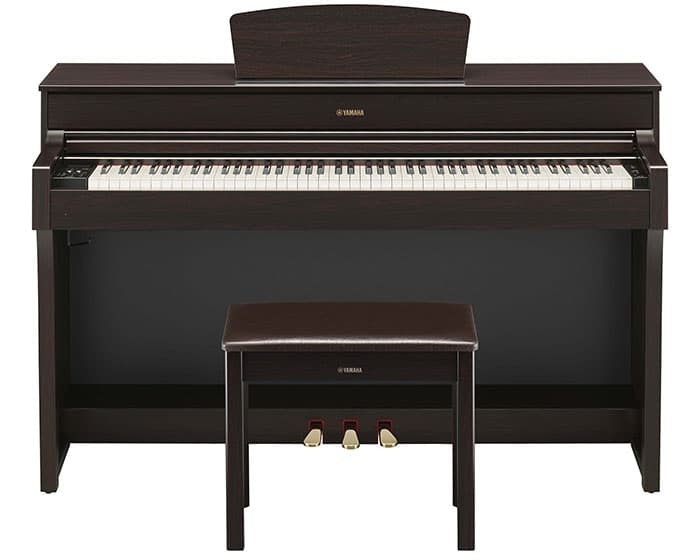 Like a lot of the other high-end models in Yamaha’s line, the YDP-184 uses the GHS (or, Graded Hammer System) to emulate the feel and feedback of a real acoustic piano. This is a big draw for serious performers looking to practice with the feel and tactile feedback of a real acoustic, without dropping upwards of $5,000 on a baby grand piano. In terms of usability, there isn’t anything stopping you from unboxing the Arius, powering it on, and going to town on the ivories. However, Yamaha’s newer model lines do suffer from a bit of a learning curve when it comes to using some of the more advanced features. There is a degree of assumed familiarity that not all users may have, and in the interest of design simplicity, interface options aren’t always as intuitive as they could be. Of course, that isn’t to say some won’t pick up the more advanced features in stride - only that some of those less familiar with digital pianos might benefit from a quick read through the manual to familiarize themselves with some of the features the YDP-184 offers, and how to use them. 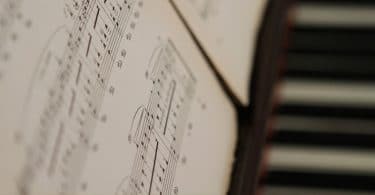 If I’m starting to scare you off, I promise it’s not as bad as it sounds - if you’re less savvy with using a digital piano, don’t be afraid to leaf through the manual - it might save you some time! As for value, the YDP-184 does come with a considerable price tag - but buyers should rest assured that the high cost is a direct result of the quality of the product. In the simplest of terms - the YDP-184 is an expensive piano because it plays, feels, and sounds like an expensive piano. The Arius YDP-184 is a somewhat trimmed down version of the Clavonia CLP-635, but is a huge jump in quality when compared to the budget series models like the YDP-181, YDP-143, and YDP-163. “The original VRM calculates the various states of the strings for each of the 88 notes on the keyboard, as well as the timing and depth of the damper pedals when pressed, from one instant to the next. It’s an impressive system that brings a powerful and flexible sound to the keys - which is honestly the number one concern of most pianists, and for good reason. The Arius YDP-184 is essentially the sound of a ~$60,000 piano at your fingertips for a fraction of the price. So, while the price tag certainly isn’t cheap, that doesn’t necessarily need to scare you off. If you’re a serious pianist, the YDP-184 is a solid investment packed to the gills with quality. The Arius YDP-184 and YDP-181 might seem pretty similar at a glance, both models having 88 weighted keys, 3 pedals, and a classy wooden exterior. However, the similarities end there - while the outside of each piano might look interchangeable, the insides are actually quite different! Aside from the difference in price - the YDP-184 being a bit more expensive than the YDP-181 - there are a few other differences under the hood. For starters, the 181 model boasts a respectable 128 notes of polyphony (the amount of tones it can express at once ) - but the YDP-184 outshines it with a whopping 256. To the untrained ear, the pianos may also sound similar, but the 184 has a deeper range and timbre that will be appreciated by more advanced players and listeners. The 181 also lacks the samples taken from the Yamaha CFIIIS Grand piano; which is a noticeable loss when compared to the 184 model. In addition, Yamaha’s Virtual Resonance Modeling (or, VRM) is a fairly important component of playback sound. The Arius YDP-184 has a bit more ‘horsepower’ under the hood, as it were, and has a good deal more capability to deliver the full sound that sampling can offer. The YDP-181 also only offers 14 voices - ten less than the YDP-184. The YDP-184 offers two 60-watt speakers to belt impressive sounds in a venue of almost any size, where the YDP-181 pales in comparison with two 20-watt speakers - fairly standard for pianos of its size, but certainly no competition for the YDP-184 when push comes to shove. The interface of the YDP-184 has a bit of a learning curve, but it’s a lot easier to get accustomed to than the 181 - which has drawn the complaints of a good amount of musicians who have used it. This is because the dimensions of the YDP-184’s display measure 128 by 64 dots, while the 181’s display doesn’t even warrant a pixel measurement due to the use of more dated segment technology. Both models do offer USB connectivity, MIDI interface, AUX in, AUX out, and speaker outputs. The Arius YDP-184 is by no means an overpriced piano. It’s expensive compared to some, but not without good reason. You can check the current price here on Amazon. While I’ll concede some products are a bit overpriced for their quality, the Arius isn’t one of them. All other concerns aside, Yamaha is a solid brand with over 100 years of experience making pianos - and it shows. The YDP-184 is a fantastic investment for the money and one of the best digital pianos available. The workmanship, design, and sound quality are all difficult to find fault in, and reviews are almost entirely positive. Even then, the handful of negative reviews I was able to find weren’t even about the piano at all - rather instances of damage during shipping, or keys arriving broken (likely from damage during shipping) - and both are covered by Yamaha’s warranty. The YDP-184 is a fantastically reviewed and expertly designed piano with sound that puts competitors to shame, and would be a solid investment for any serious musician.